To build the capacity of young North Korean defectors in South Korea and to encourage them to become more engaged on issues related to North Korean human rights and democracy. Baekdu-Halla will organize an online democracy education program and offline seminars, and provide young defectors with opportunities to interact and build networks. To bring international attention to the human rights situation in North Korea. The Citizens’ Alliance will promote awareness among South Koreans about North Korea and test methods of assisting North Koreans living in South Korea to adjust to citizenship in a democratic society. To disseminate accurate and timely information about North Korea. The Daily NK will produce an online newspaper serving audiences in South Korea and in the international community. The newspaper will include news and information about North Korean human rights issues as well as developments in North Korean politics and economics. To make publicly available well-organized documentation on human rights conditions in North Korea. The database will organize information from interviews as well as published and unpublished written testimonies. The Center will also publish an annual white paper and special thematic reports in Korean and English, and will carry out individualized data searches upon request for researchers, governments, UN bodies and human-rights advocates. To support the free flow of information in North Korea. Free NK will produce and broadcast a daily radio program to increase the news, information, and independent commentary available to North Korean audiences. To provide a platform for North Korean citizens to share information and opinions about North Korean culture, economics, politics, and other developments. Imjingang will produce a Korean-language quarterly magazine using materials gathered by reporters and distribute copies throughout the Korean peninsula and to Korean-speaking experts in the international community. To promote the free flow of information. InterMedia will conduct survey research documenting various dimensions of the listenership response of international broadcasting in North Korea, and provide non-governmental broadcasters with independent, reliable data about audience behaviors and preferences as an aid to making future programming and formatting decisions. To develop democracy education materials suitable for people raised in repressive environments; and to raise awareness of democratic ideas and values. NKnet will work closely with North Korean citizens and experts to develop and test a multimedia curriculum that is user-friendly for those born and raised in North Korea. To provide a forum in Seoul for discussion of the future of North Korea. NKnet will hold strategy sessions to explore effective means of promoting economic and political liberalization in North Korea. To support the free flow of information into North Korea. NK Communications will produce the North Korea Reform Radio program, providing daily broadcasting of news, information, and commentary designed to encourage the development of independent public opinion inside the country. To facilitate the free flow of information. NKIS will produce a digital magazine containing accurate and balanced news and information and diverse views about major issues in South and North Korea and around the world. This project will be a pilot test to assess the potential impact of this approach. To support the free flow of information in North Korea. Open North Korea will maintain a radio platform that enables organizations and groups in South Korea and elsewhere to broadcast information and feature programs to North Korean audiences. To support the free flow of information in North Korea. Radio Free Chosun will broadcast its daily program, providing news and features on the Korean peninsula, to the North Korean public via shortwave radio and will maintain a web-based archive of programming for other interested listeners. To build the capacity of North Korean defector students in South Korea and to encourage them to become more engaged on issues related to North Korean human rights and democracy. YDA will organize its leadership education program to help equip defector students to serve as bridges between South and North Korea and to take an active part in civic life in a future democratic North Korea. To educate participants in the North Korean informal markets about entrepreneurship, free markets and the linkages between economic and social liberalization. CIPE will expand and refine its digital economic library of educational and analytical materials tailored to the particular needs of the intended audiences. To instill democratic values and cultivate political leadership among North Korean defector women and to encourage partnership and cooperation between South and North Korean women in promoting democratic change for North Korea. The Center for Korean Women and Politics will implement a democracy and leadership program for North Korean defector women, which will also serve as a platform through which North and South Korean women can address any existent biases and misperceptions and begin to build trust among participants. To bring international attention to the human rights situation in North Korea and to promote awareness among South Koreans about North Korea. Citizens’ Alliance will advocate for human rights in North Korea at the UN in Geneva, organize an international conference on North Korea in Asia, and provide democratic civic education to North Korean defector youth. To build trust and engage in constructive dialogue on North Korean human rights. The Korea Human Rights Foundation will carry out a roundtable dialogue project bringing together key actors from various North Korea-related fields in South Korea to encourage inter-sectoral dialogue on enhancing North Korean human rights. It will also explore the role of international human rights organizations and regional networks such as the Asia Democracy Network in enhancing North Korean human rights. To strengthen the leadership capacity of North Korean defector students in South Korea and encourage their engagement in North Korean human rights and democracy issues. Now, Action and Unity for Human Rights (NAUH) will carry out a series of educational and networking activities for South Korean and North Korean defector students, a leadership training program, and a public awareness campaign on North Korean human rights. To raise awareness of democratic ideas and values among North Korean citizens. The organization will provide a structured democracy and market economy education program for North Korean citizens in the region, utilizing democracy education materials that are user-friendly and relevant to those born and raised in North Korea. To document human rights violations and increase international attention and pressure to address the dire human rights situation in North Korea. NK Watch will interview defectors who have experienced or are familiar with human rights violations in North Korean detention facilities, document their findings, file petitions to the UN on behalf of victims or their families, and share the information with the international community to strengthen North Korean human rights advocacy efforts. To support the free flow of information into North Korea. NKRI will produce the North Korea Reform Radio program, which provides daily broadcasts of news, information, and commentary designed to encourage reform and the development of independent public opinion inside the country. To gain a better understanding of multimedia and information technology infrastructure in North Korea to improve the free flow of information inside North Korea. The North Korea Strategy Center will research and produce a report on the multimedia and IT infrastructure in North Korea and work with media organizations and technology experts to improve efforts to disseminate independent news and information in North Korea. To provide independent information and raise awareness of freedom, human rights, and democracy in North Korea through radio drama production. The North Korean Writers in Exile PEN Center will produce a weekly radio drama called “Chonbok and Mankil,” which will illustrate the lives of ordinary people in a free world as well introduce key concepts of human rights and democracy to North Korean listeners in an easy-to-understand and humorous manner. To support the free flow of information in North Korea. Radio Free Chosun will broadcast its daily program, which provides news and features and in-depth analyses on current affairs and issues in the Korean peninsula, to the North Korean public. To disseminate accurate and timely information about North Korea. 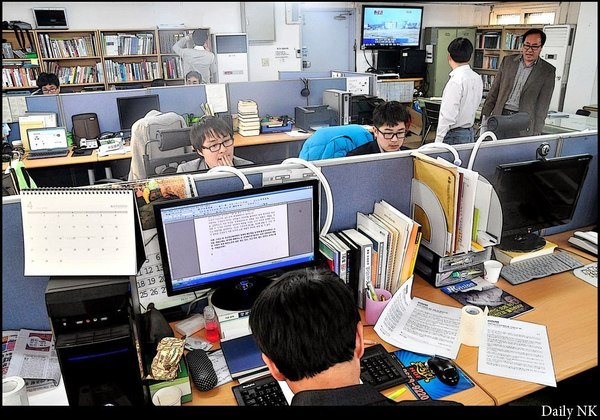 The Daily NK will produce an online newspaper serving audiences in South Korea and in the international community and provide training to empower North Koreans working as citizen journalists and its correspondents in the Asia region. The newspaper will cover news and information about North Korean politics, economics, and society. To build the capacity of North Korean defector students in South Korea and to encourage them to become more engaged on issues related to North Korean human rights and democracy. Young Defectors Alliance for North Korean Human Rights will organize a variety of leadership programs, including a democracy education program, an online magazine and video project, public seminars, and a debate competition, to help equip defector students to serve as bridges between South and North Korea and to prepare them to take an active part in the civic life of a future democratic North Korea. To provide democracy and free market economy education and training to North Koreans who are active or potential participants in the jangmadang private markets. The project will provide multimedia education on basic concepts of democracy and critical thinking as well as hands-on free market economy experience to North Koreans who work in the private markets and who are well-placed to convey new ideas to a wider population in North Korea. To increase opportunities for North Korean defectors to share accurate information about North Korea, and their experiences living in democratic South Korea, with the citizens of North and South Korea. The project will include posting defector-written blog pieces and hosting online forum discussions with North and South Koreans on a variety of democracy-related issues. To provide a platform for North Korean citizens to share analytical information and opinions about North Korean culture, society, economics, politics, and other developments. The project will recruit North Korean citizens visiting in the Asia region, provide intensive training on fundamental concepts of democracy as well as basic writing and analytical skills, and produce a Korean-language quarterly magazine using information collected by the participants, to be distributed in the Asia region and South Korea. To develop democracy and leadership educational material suitable for North Korean youth. This project will develop self-study material for young North Koreans who are interested in learning about democratic ideals and values. Topics will include free-market economic principles and regulatory frameworks, the rule of law and access to justice, and the challenges of transition. To develop democracy and leadership educational material suitable for North Korean youth. This project will research, test, publish and distribute self-study material for young North Koreans who are interested in learning about democratic ideals and values. Topics will include free-market economic principles and regulatory frameworks, the rule of law and access to justice, and the challenges of transition. To raise awareness of democratic ideas and values among North Korean citizens. The project will provide a structured democracy and media education program for North Korean citizens in the region, utilizing multimedia educational materials developed for those born and raised in North Korea. Grant descriptions are from the 2014 NED Annual Report.